Regardless of what you have in your fleet, brand new, second hand or vintage, they all have windscreens. If you think they are just glass, then you’re not quite right, there is a lot more to them than that. 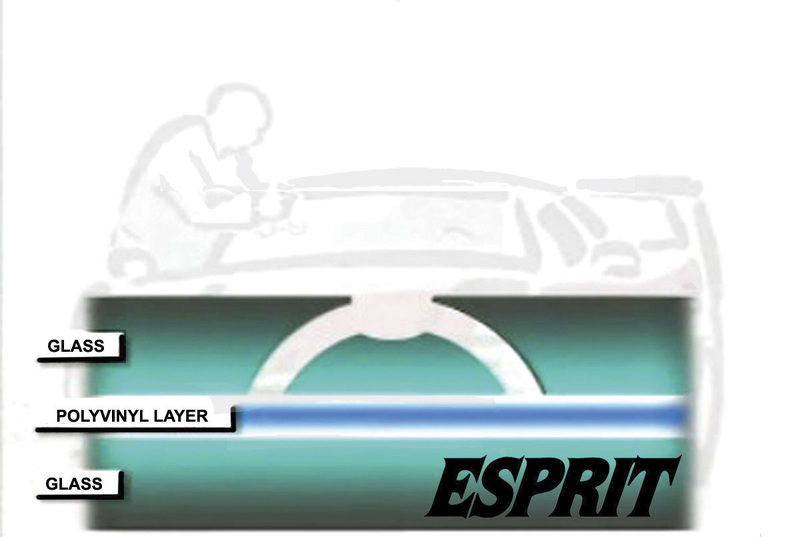 Here, General Manager of Esprit, the windscreen crack and chip repair kit specialist, Neil Skidmore, has sent us an interesting insight into the story of windscreen development. He then takes us through the windscreen repair process. Without further ado, Neil delves into his area of expertise. In the early days of motoring, windscreens were made out of ordinary window glass. A cheap, readily available product with only one major problem: in the event of an accident the motorist could be seriously injured by the broken glass. After a number of law suits, the motor manufacturers looked for a more suitable material for windscreen manufacture. This was toughened (also known as tempered) glass. It was cheap, had good optical properties and if broken in an accident it would fragment into thousands of small mostly harmless pieces. The downside to this type of windscreen was that a simple stone impact would shatter the glass, leaving the motorist with no choice but to remove the remains of the windscreen until a replacement could be organised. In 1903, a French Chemist, Edouard Benedictus, discovered the principal of laminated glass. His early work on the production of a glass plastic composite for automobile windscreens was not immediately adopted by the manufacturers. The first large scale adoption of this new laminated type of glass was in the production of eyepieces for WWI gas masks. Henry Ford pioneered the use of laminated glass automobile windscreens. Between 1919 and 1929 he ordered the use of laminated glass in all his vehicles. Laminated glass windscreens overcome the main problems of the earlier toughened windscreen in that when hit by a stone the impact does not shatter the windscreen. The downside now was that you had a localised area of damage that would eventually spread, still resulting in the replacement of the glass. 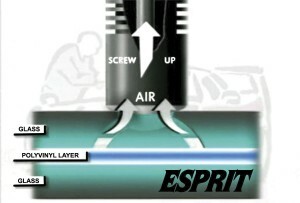 It was to overcome this problem that Esprit developed their first windscreen repair system in 1982. A windscreen repair is a simple bonding process where an optically clear resin is injected into the damaged area of glass. When the resin is cured it produces a permanent repair that restores strength to the damaged area and also regains about 90% of the optical performance. Two of the main features of windscreen repair are the low material cost per job (about £2 per repair) and minimum vehicle downtime with a repair taking 20 to 30 minutes, after which the vehicle can be used as normal. – Neil Skidmore of Esprit. The next part of this article will take you through the simple steps of a stone chip repair. In the centre of all damage is an impact point where the stone hit the glass. 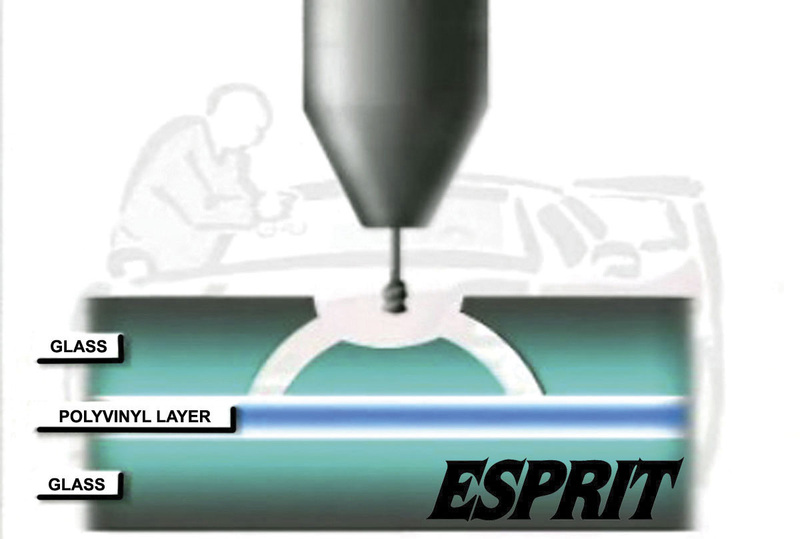 This impact point is the natural injection point for the repair resin. It is possible that this area will be blocked with broken glass and dirt, which will restrict the flow of the resin into the break, so it is important to clean it out using a 1mm tungsten drill bur. The next step is to set up the repair bridge. 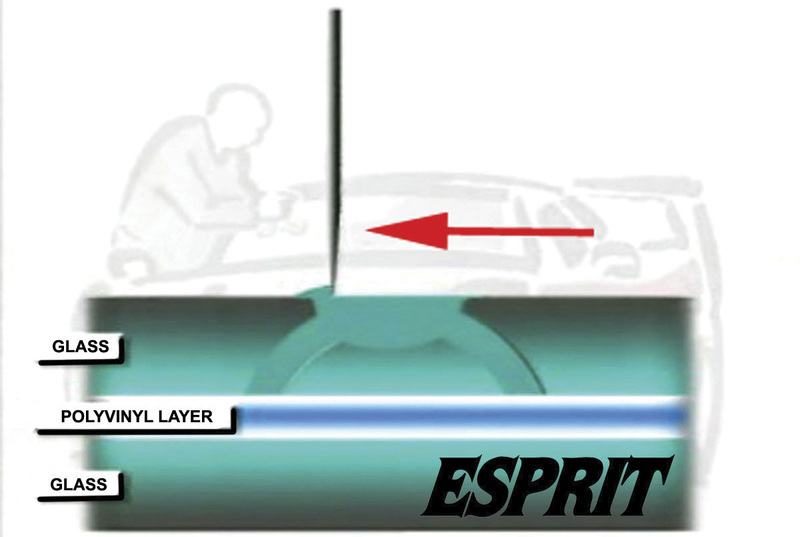 With the Esprit Elite repair bridge this is a simple process of raise the lever, position the repair bridge, press it down and then lower the leaver. 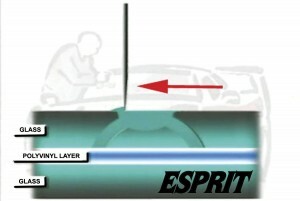 The injector body is screwed into the holder until the rubber seal makes firm contact with the glass. Using the syringe and needle supplied in Esprit’s kit, 0.2 ml of the windscreen repair resin is put into the injector. The piston is then screwed into the injector barrel. As the plunger is screwed down, it will begin to compress the resin, building up pressure, forcing the resin into the break. 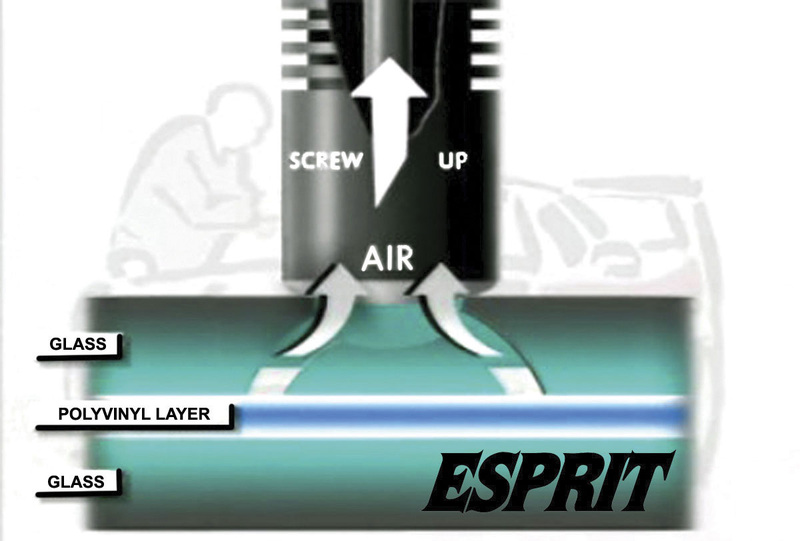 When the system is pressurised, wait three minutes, giving the resin time to penetrate into the break. As the resin is forced into the damaged area, the air is displaced leading to the visual improvement. When the break has been under pressure for a minimum of three minutes, the piston is unscrewed about 10mm, until the thread becomes visible. 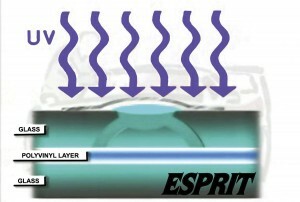 This will introduce suction on the backstroke, drawing more air out of the damage. We then repeat the three minute pressure cycle followed by 30 seconds pressure off. This time the glass is warmed immediately behind the damage. It is now time to inspect the break. 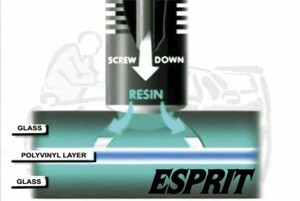 Move the injector to one side, wipe away any excess resin and inspect the break. 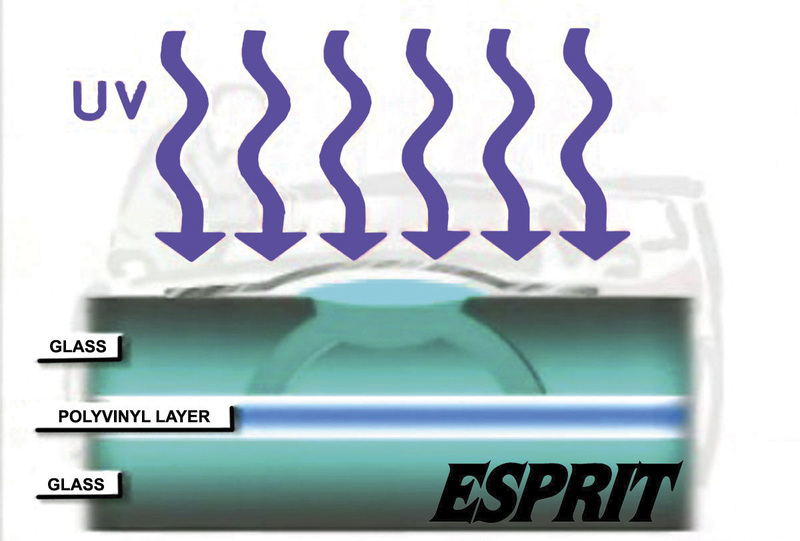 If air remains in the break then repeat the three minute pressure cycle. If the break has filled with resin then finish the repair and cure the resin as follows. To cure the resin, press the UV lamp onto the glass immediately over the repair area. Switch the lamp on and leave it for a minimum of five minutes. After curing, shave off the excess resin with a single sided razor blade and polish the repaired area using the pit fill polish and a piece of very soft polishing cloth to put the final shine on the pit fill area. The repair is now complete and the vehicle is now ready for use without any further downtime. 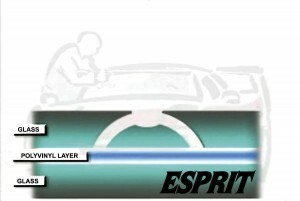 If you would like more detailed information on the windscreen repair process, contact Esprit on 0800 432 0982 and ask for a free copy of its Thatcham produced windscreen repair training DVD.